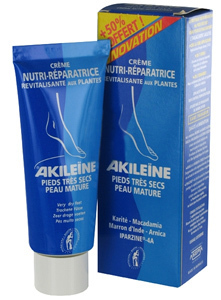 *This new formula replaces Akileine Regenerating Dry Foot Cream. Designed to relieve dry, cracked feet and calluses, this unique treatment cream offers much needed hydration and relief instantly. Includes a complex of natural shea butter, macadamia oil and plant glycerin to nourish the skin, while IPARZINE®-4A (a Laboratoires ASEPTA exclusive and patented active ingredient) offers repair and anti-aging properties. Also includes arnica and horse chestnut to stimulate circulation and regenerate the skin. Instructions: Apply twice daily to feet or as needed.